“Pickle” is a common name for pickled cucumbers in the United States and Canada. 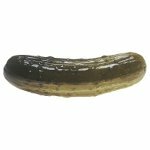 In the United Kingdom and Australia pickled cucumber are usually called gherkins. French pickles made from small cucumbers pickled in vinegar and tarragon are referred to as cornichons. Pickles are a popular side dish in the United States. The are also often used as a condiment on sandwiches. Pickle relish is one of the typical hot dog garnishes. Pickles can be served alone on a stick as festival foods. Deep-fried dill pickles are a popular dish in the Southern United States. By the way, you can try your hand at cooking deep-fried pickles in honor of the National Pickle Day. In a medium bowl, combine 3 cups breadcrumbs, 1 tsp garlic powder, 1tsp ground black pepper, 1/2 tsp salt, and 1/2 tsp cayenne pepper. In a separate bowl, whisk 1 cup milk and 1 egg together. Quarter 4 dill pickles lengthwise. Dip each pickle spear into the egg mixture, then into the crumb mixture, repeat. Arrange pickles on a baking sheet and place in the freezer for about 30 minutes. Heat 2 cups vegetable oil in a deep fryer to 350 °F. Fry the pickles until golden brown.